JEANS IS LIGHT MADE. Knee: 7.50" (19 cm). Bottom Leg Opening: 6.50" (16.5 cm). Outside leg length: 43" (109.5 cm). Bottom of Pant leg opening: 8" across. Rise: 10" to top of waistband. 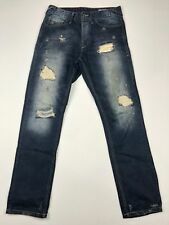 Men's Jack & Jones Originals slim Jeans 36x34. Condition is Pre-owned. Shipped with USPS Priority Mail. Straight leg. signature embroidery at the back right. MODEL ID: Ben Original 774. Rise (front): 10" (26cm). Leg opening: 6.5" (16.5cm). Very good pre-owned condition Jack & Jones comfort fit button up jeans size 36" x 34". Made in Italy. Leave room for fit! They are size 30. They are made of 100% cotton. The waist layingflat is 15"and the inseam is 34". They are in GOOD CONDITION with the pants no holes or stains and the bottoms having little or no fraying. Slim fit jeans featuring a classic 5-pocket look, a button-fly closure and a faded gray look. The Glenn fit consists of a low rise, a slim thigh, a skinny knee as well as a tight leg opening. Slim fit jeans. Inseam: 34. S 46 23 90 36R S. L 40 40 12 42 44 10 M. XL 54 27 106 44R L. 3XL 46 46 18 48 50 16 XL. 3XL 58 29 114 48R XL. L 52 26 102 42R L. Bank account details.